BIOMASS is an organic substance formed as a result of the photosynthesis process. Left on the soil surface in the form of mulch (crop residues, green fertilizer, weeds) improves its efficiency, and after plowing and humification becomes caries. It can be a source of renewable energy carriers. Rational combustion of biomass does not increase the amount of carbon dioxide in the atmosphere. Biomass waste materials and fuels, i.e. wooden waste, sawdust, bark, straw, hay, turf, balks, bean pods, fruit stones, spoiled grains can be burned in an ecologically safe and energy-efficient way. Woody parts, eg wood, cereal straw, hay and by-products of seed and fruit processing such as pomace, oil cake, etc. are an alternative to fossil solid fuels. Agricultural products, eg potatoes, beets, cereals, fruit as high-energy fuel additives in the form of alcohols and ethers, may be a reason to reduce the consumption of gasoline produced from crude oil. Fats from agricultural products – oils: rapeseed, sunflower, soy, coconut, mustard, agrimony, radish, flax and olives are an alternative to diesel oil produced from crude oil. Processing waste, from which methane is produced using bacteria, is an alternative to natural gas and other industrial gases. In the combustion chamber of the heating plant, straw can be burned in the form of dry chaff, granules, dust, whole bales and jagged bales. Straw bales are transported using a conveyor to the straw chopper and after crushing they reach the cyclone, where the dust is removed. The dust is transported by a fan directly to the combustion chamber. From the cyclone, the straw shred is conveyed to the combustion chamber of the heating plant. During combustion, a boiler with water is heated, from which the heating network is discharged (eg residential estate). The product of burning straw, apart from heat, is fumes and ash. 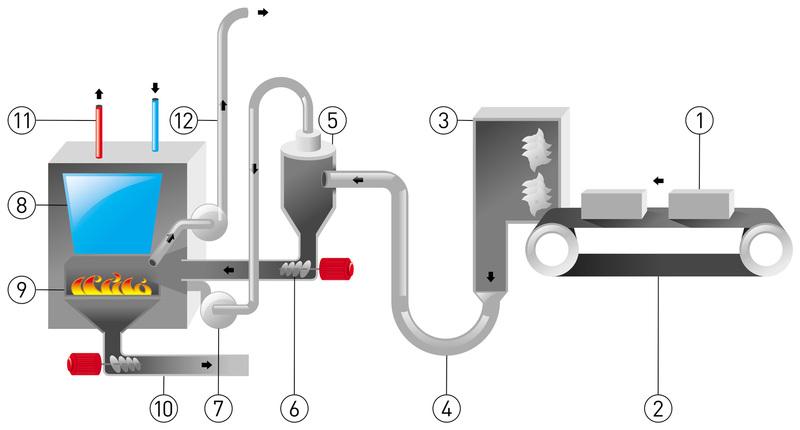 The flue gases are discharged into the atmosphere through the chimney, while the ash is conveyed to the outside of the boiler using the conveyor. Carbon dioxide obtained in the process of straw combustion is classified as environmentally friendly gas, because it circulates in nature in closed, annual cycle.